Is there a risk when buying a used loading dock? All of our used loading docks are sold "as is." This scenario is the same with used cars, boats, or other major purchases. Your risk is that an unforeseen defect exists that requires repair. We maintain a very conservative approach to the purchase of used loading docks for sale and rental, and we believe we have significantly limited the risk of a poor purchase by our customers. Our careful evaluation of used loading docks for safety and efficiency leads to our presenting them in one of five conditions: New, Like New, Excellent, Very Good, and Good. Read this blog for details on these categories. I found a used loading dock on my own but have no idea if it’s worth what the seller is asking. Can you help? Well, we wish we could be "The Guy" for every used loading dock bought and sold, though we know this is not possible. That said, we’ll be happy to evaluate any loading dock presented to us and give you our honest opinion of its value. I found a used loading dock. Will The Yard Ramp Guy give me a finder's fee for a referral? ABSOLUTELY! If you refer us to a used portable loading dock seller and we complete a deal for their loading dock, we will gladly send you a check for $222.00, along with our gratitude for contributing to our success. I expected a used loading dock to be at least half the price of a new ramp. Why do your prices seem high? As you’ve likely discovered, used loading docks are difficult to find. And good loading docks are even more difficult to find. The pricing you see posted on our website is the retail value of the unit. When shopping for a loading dock, remember the bottom line. Keep in mind the cost of the loading dock, plus freight. 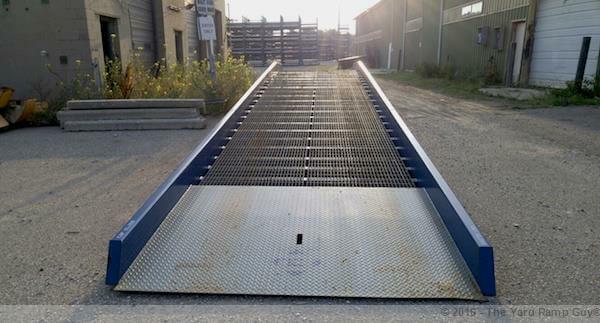 It is not unusual for a used loading dock to cost more than a new ramp if you happen to be close to one of the few reputable yard ramp manufacturers or distribution centers. Still, with many years of use remaining on the used loading docks you see on The Yard Ramp Guy's site, the value can be outstanding. Certain specifications of capacity, length and width are more marketable than others. And certain combinations of specs are more marketable than others. Most factories claim a ramp under normal continuous use will last 15-20 years. In our experience, we’ve also seen very good ramps that are 20+ years old. This matters greatly. Again, in our experience, only those ramps made by reputable manufacturers using U.S.-made raw materials, employ certified welders, and can verify their engineering claims retain value. Most ramps made outside—and, yes, many inside—the U.S. are not quality ramps. There simply is not a reasonable expectation of either long service life or safety standards. We rate ramps as New, Like New, Excellent, Very Good, and Good. 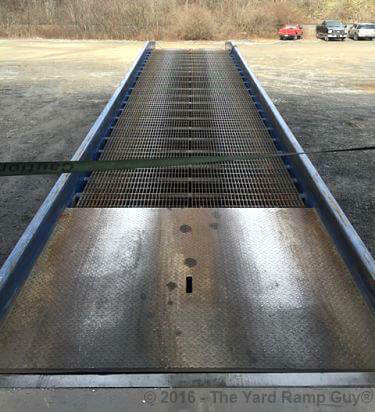 A ramp rated as Good may be older or in some need of maintenance or repair due to normal use, though they can be expected to work safely and improve efficiency in an otherwise inefficient operation. Ramps not deserving of a Good rating will possess one or more of the following characteristics: disrepair that cannot be refurbished without considerable cost or confidence of high safety standards; unknown manufacturer; known manufacturer with poor reputation; or excessive age relative to condition. All of these factors combine to influence a ramp’s marketability. The Yard Ramp Guy® is acutely in tune with industry pricing at the wholesale, dealer, professional reseller, and private seller levels. In addition, we know the marketplace for new, used, and rental demands throughout the United States—and over the ebb and flow of the calendar year. Combining this information with our knowledge of freight costs and freight lane ratios, we are able to determine the highest reasonable value of any particular ramp. In our case, we want our sellers to make fair money, our buyers to feel they secured a great deal, and The Yard Ramp Guy to make a fair profit for the effort. Q. I found a used yard ramp. Can I get a finder’s fee for referring The Yard Ramp Guy with the seller? A. Absolutely! If you refer us to a used yard ramp seller and we complete a deal for their ramp, The Yard Ramp Guy will send you a check for $222.00…with our thanks for contributing to our success. Q. I found a used yard ramp on my own but have no idea if it is worth what the seller is asking. Can you help? A. While we wish we could be “the guy” for every used yard ramp that’s bought and sold, we know that is not possible. Still: we’ll be happy to evaluate any ramp presented to us and give you our honest opinion as to its value. Q. What is my risk when buying a used yard ramp? A. All used yard ramps are sold “as is”—no different than used cars, boats, or other major purchases. Your risk is that an unforeseen defect exists that requires repair. Because we take a conservative approach to the purchase of used yard ramps for sale or rental, we believe we’ve limited the risk of a poor purchase by our customers very significantly. Q. I expected a used ramp to be at least half the price of a new ramp. Why do the prices seem high? A. As you probably know from your own research, used yard ramps are difficult to find. Good used yard ramps are even more difficult to find. The pricing you see is the retail value of the unit. When shopping for a yard ramp, it’s important to never forget the bottom line (consider the cost of the ramp plus freight). It is not unusual for a used ramp to cost more than a new ramp if you happen to be close to one of the few reputable yard ramp manufacturers or distribution centers. Still, with many years of use remaining on the used yard ramps you see on our site, the value can be outstanding. Q. Do you have additional used ramps not shown on The Yard Ramp Guy site? A. Quite probably. We try to keep the map updated daily. But we may have potential used ramp opportunities where we are still waiting for photos from the Seller, still working out the pricing or, perhaps, having some work done on the condition of the ramp. We encourage shoppers to call us or Request a Quote. Still have questions? The Yard Ramp Guy will be happy to discuss and clarify with you. You may see a ramp near you but if it does not meet the requirements of your need, it might as well be a bicycle. You may see the perfect ramp for your application, but if it is geographically undesirable (read: high freight cost), it might as well be grocery cart. Used ramps are priced to match the market demand. Before you rule out a ramp because you believe it is priced too high, let’s talk. The Yard Ramp Guy will not only guide you through your selection process, but will present some ideas related to your cash that our competitors are not willing to offer. The Yard Ramp Guy receives several calls per week from sellers of yard ramps. Used ramps typically sell quickly. It is quite possible we have used yard ramps that have not been posted to our site yet. Did you know CarMax™ supplies 75% of the used cars sold on competitor used lots? They take in an enormous number of used cars but only keep 10% of those vehicles to sell on their own lots. Why? They only keep the very best of the used cars they buy from consumers. The Yard Ramp Guy takes a similar approach. Why? There are only two reasons to own or rent a yard ramp: Efficiency and Safety. A yard ramp in substandard condition eliminates 50% of the value and jeopardizes the ability to achieve the other 50% of the value.